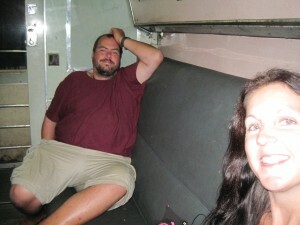 AFTER so long travelling together, there is a bit of a danger of a truck uniform developing. We all have items of clothing which get worn a lot more than the rest, but chances are a quick glance around the truck will spot a selection of hoodies (almost exclusively blue, worn when the wind is whipping in the side of the truck), shorts, quite possibly khaki, (Kris and myself managed to buy the identical pair from the same shop in a giant Cape Town mall) or tracksuit bottoms, flip-flops (almost all Havaianas) and T-shirts (which people have differing ideas about how long they can be worn without changing). Throw in growing collections of bracelets, the odd baseball cap and sunglasses and that’s pretty much the Trans Africa uniform – although the girls have a tendency to thrown in the odd dress and skirt, just to mix things up. If they were relatively clean and comfortable on the truck, sure some of the boys would go for that as well. That all changed at Kande Beach, Malawi, when clothes were dispensed off altogether (increasingly so as the evening wore on), but more of that later. Since Victoria Falls, we have gone a step further with matching tour T-shirts in a range of colours (although a quick look around camp suggests most of them are actually with the laundry women or, for those who opt to do their own washing, hanging from a line). Trouble is, the design (which somehow fell to me) is already out of date. The back of the T-shirts features the map of Africa with each country’s name spelled out to form its boundaries, with the ones we visit then picked out in yellow to mark the route. But having donned our new (clean) clothing marking out Mozambique, we headed north out of Zimbabwe instead and took a detour through Zambia before rejoining the original route in Malawi. As well as saving us money – a combined Zimbabwe-Zambia visa is considerably cheaper than one needed to pretty much drive through Mozambique – it also provided the chance to break new ground for the Trans trip. Not that we were in Zambia that long, making our way across the country to the Malawian border in just a couple of days. But that was long enough for the contrast between Zambia – not a rich country, but one starting to show the signs of growth – and Zimbabwe as we drove past any number of building works and developments along the roadside (the capital Lusaka is shaping up to look like the type of city Harare could be). Which, together with the number of people and villages which dotted either side of the road regardless of how far we got into the countryside, made the hunt for a place to bush camp a lengthy one. Many of us were looking forward to getting back to bush camping, which provided a staple of our time journeying through West Africa, but which are few and far between on the more developed east. And by the time darkness was falling over Zambia and a few extra layers had been wrapped over the standard truck clothing, we were really looking forward to a bush camp. Only trouble is, every time we spotted a likely path off the side of the road, it turned out there was a village at the end and we headed off to try again. 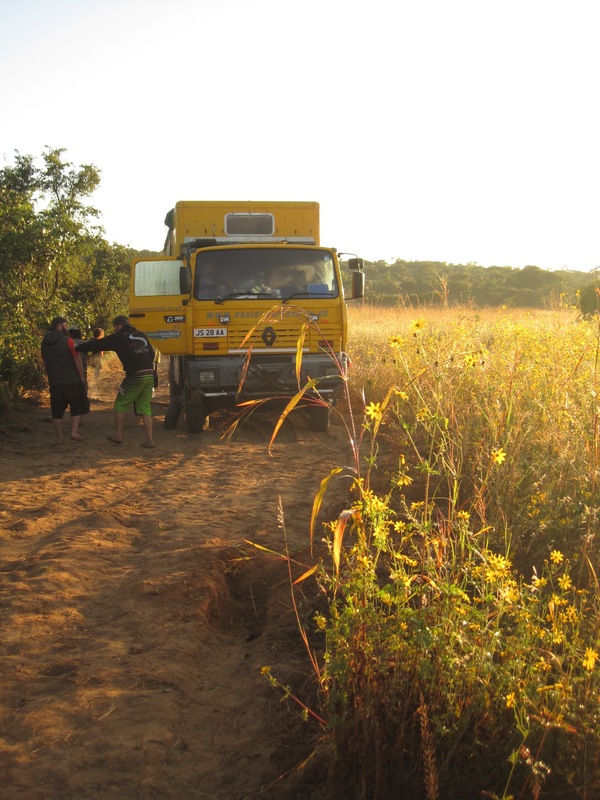 Eventually, we pulled off onto a track not much wider than Nala, squeezed a fire alongside to cook the evening meal and stretched our tents out in single file in front of the truck. And then the local farmer arrived on his bike. Pretty sure the vast majority of farmers back home finding a big yellow truck and its inhabitants setting up camp alongside his crops are far more likely to greet them with a “get off my land” than a smile, a handshake and a warm welcome – and goodbye early the next morning, even as Nala reversed over some of his crops to get back out on the main road. The return to bush camping was brief as we returned to campsites either side of the border, the first reuniting us with more overlanders and the second, in the Malawian capital Lilongwe, with (rapidly used-up) wi-fi as we made our rapid way to a rendezvous with the beach. Two beaches to be exact as we wound our way north through this sliver of a country along the banks of the lake which shares its name and covers a huge part of its surface. 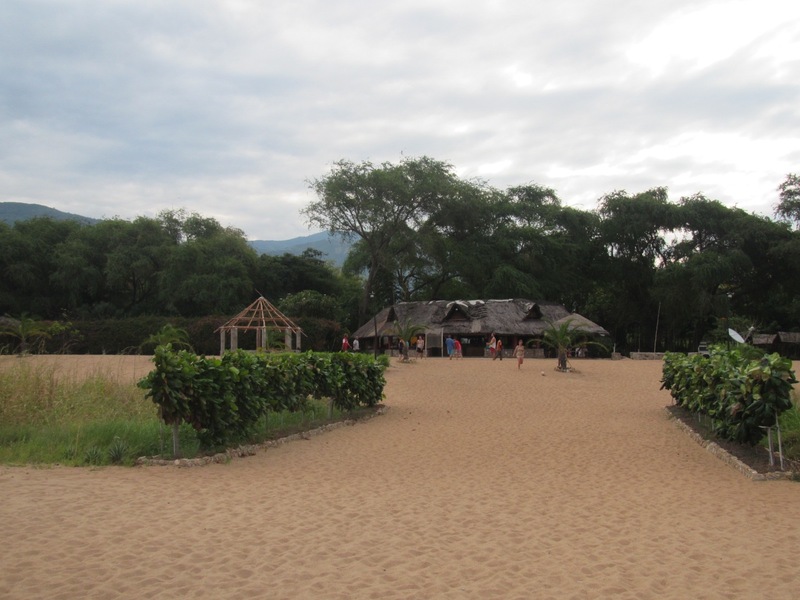 First up was Kande Beach, a bit of a mecca for overland groups since it was opened by a former tour leader who used to bush camp on the spot he eventually bought and turned into a restful base for a couple of nights. Maybe restful is not the right word. 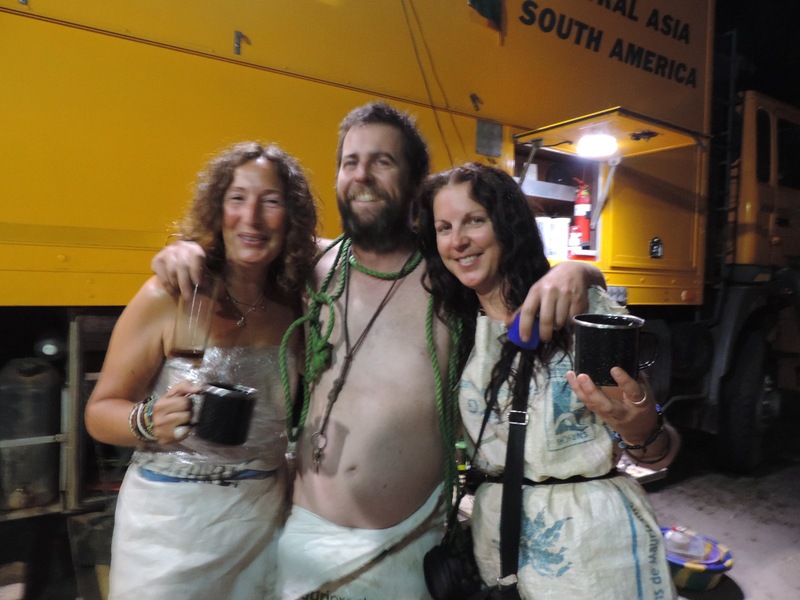 Tradition demands each truck marks its stay at Kande with bit of a party, a tradition we had no intention of ignoring (even if it did provoke a couple of late-night requests for quiet from one of the other groups in camp). Having spent the afternoon fighting for the truck title in Beersbee* – a beach game involving throwing a frisbee at a beer bottle balanced on a pole, all the while holding (and supposedly drinking from) a different beer bottle – events moved to round the food eskie which, thoroughly cleansed, was used for a rather potent punch which rather stole the show from the goat the staff had been cooking over the fire all afternoon. And, challenged to come dressed in anything bar clothes, the group rose to the occasion – donning sleeping bags, rugs, potato sacks, bin bags, toilet paper and, best of all, some egg trays – before heading to continue the party in, around and, if memory serves me right, on the bar as we toasted the arrival of our 200th day on the road. Not surprisingly, our second day at the beach was rather quiet before we upped sticks and moved up the shoreline – via a craft market which filled any remaining space in our heaving lockers – for another two nights at Chitimba, where we took the chance to kick back, relax and chat with one of the other trucks we had already bumped into and another Oasis group (bolstered by Katie from the office) heading in the opposite direction. Some people found enough energy to head out and tour the local village and (another) craft market – which did require plenty of energy – but for most of us, it was a pretty chilled time until the lure of the beach volleyball court drew members of both Oasis trucks out onto the sand. Being kind, the sports journalist in me would describe some of the play on show as mixed, topped by Kris who, with the added advantage of height, was evidently pretty good at this sort of thing in his younger years. He certainly hits the ball pretty hard. Especially if it happens to be your face in the way as you attempt a block up close to the net. Still, forgot about my foot for a bit. * Reto and myself were edged out in the semi-finals, having seen off the self-proclaimed champions from our last game, with the title eventually going to the one pair who were not drinking from the bottles (or flip-flops) they were required to hold. These facts may be linked. 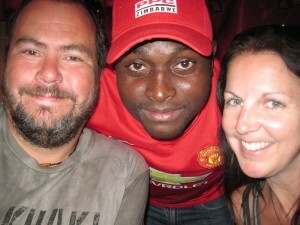 THERE’S a tale from the weekend Karla and myself spent in Bulawayo that sums up a lot about Zimbabwe. Having popped out for breakfast on the Sunday morning – eventually giving up finding a cafe open and installing ourselves at one of the myriad of pie/pizza/chicken places which dot the city – we went into a shop for Karla to buy something. After paying in US dollars, she was given the change in South African rand. Not wanting to be saddled with coins from a country we had left, in the next shop she asked if they would accept the rand to pay for a drink. Having been told no, she again paid in dollars – only to be given the change back in rand. Not sure if that is better than the chews and lollipops often given out in lieu of small amounts of change, but it does show the confusion and hurdles which need to be overcome if Zimbabwe is really to emerge from years of turmoil. Zimbabwe is far from alone among African countries in not being able to sort out change. Coins are very much an afterthought (and largely worthless), while nobody in shops appears to have a stock of smaller notes, bar Namibia and South Africa when actually being handed the correct change came as a major shock. Instead, we have been given too much change, too little, had staff rifling through their own bags for notes, given credit which the person serving can never remember when you come to get the next drink or offered anything from sweets to packets of cigarettes to make up the change. Whatever Africa’s economic woes, somebody, somewhere is making a fortune from all the change which is never given out. But in Zimbabwe, the mix of two other nations’ currencies sums up the state of flux which continues to run through the country. Unlike many of the less developed countries we passed through on our way down the west coast, Zimbabwe clearly has – or had – an infrastructure in place. Both Bulawayo and Harare are cities waiting to be brought back to former glories, boasting most of the requirements for a thriving modern metropolis. But the emphasis is on the waiting. As it stands, the country is fraying badly at the seams as years of mismanagement and neglect have taken their toll under the leadership of Robert Mugabe (though doubt the power cuts which hit the city pretty much daily occur around his plush pad). Pretty much all major buildings you walk into in Zimbabwe, be it hotels, banks or (trust me on this) doctors’ surgeries, have a big picture on the wall of the man who has, pretty much single-handedly, led the country since independence. For how much longer remains to be seen. He is 91 and at some point in the not too distant future, he will get his wish to have been President for Life and somehow the void he leaves behind needs filling if the country he has run into the ground over the past three decades or so is to continue the improvements we were repeatedly told had been slowly happening since the days of land grabs (which removed not only white farmers, but also their knowledge and experience in producing crops – much of which is now being utilised in neighbouring Zambia to export food back to their homeland) and hyper inflation. Who takes over is critical for a country which is so rich is so many areas – the people were unstintingly friendly during our stay and it boasts enough natural wonders (Victoria Falls, mountain retreats, abundant wildlife and the huge man-made Lake Kariba, our final port of call before popping over the dam which created it into Zambia) for the slowly increasing trickle of tourists returning to the country to become a flood. And, depending on who you talk to (and who is willing to talk to you without fear of being overheard in a land where free speech and a free press is some way off), there are tales of untold riches to rival those which have helped the likes of Angola, Botswana and Namibia become economic success stories. All of this, of course, is watched closely from around the world. The Chinese are making their presence felt across Africa – providing an ever-improving ribbon of asphalt through previously tricky terrain – while even North Korea has close contacts with Uncle Bob. Watching on even closer is the local powerhouse of South Africa, while the dollarisation of the currency and historic links suggest the US and UK are going to be watching what (or who) happens very carefully, to say nothing of the rest of Africa and the Commonwealth. Internally, opposition leader Morgan Tsangverai appears the obvious alternative to any pre-ordained succession to wife Grace, having already had a taste of leadership in a power-sharing experiment, but who eventually steps into Mugabe’s shoes – and how far they are willing or able to walk in them from Uncle Bob’s path – has a massive job on their hands. Ideally, this post would be extolling the virtues of a country which has so much which is easy to like. Our final farewell on the banks of Lake Kariba was hardly action-packed – bar those who opted to stroll from our base into town, only to be picked up by a passing car as walking through a national park containing so many wild animals was not the best idea. For those of us who stayed in base camp, we did not have to strain too hard to spot those animals – a quartet of elephants spending a good hour or so splashing about in the shallows, surrounded by the bobbing heads of numerous hippos, while those who ventured closer to the water assured us there were plenty of crocodiles hanging around as well. 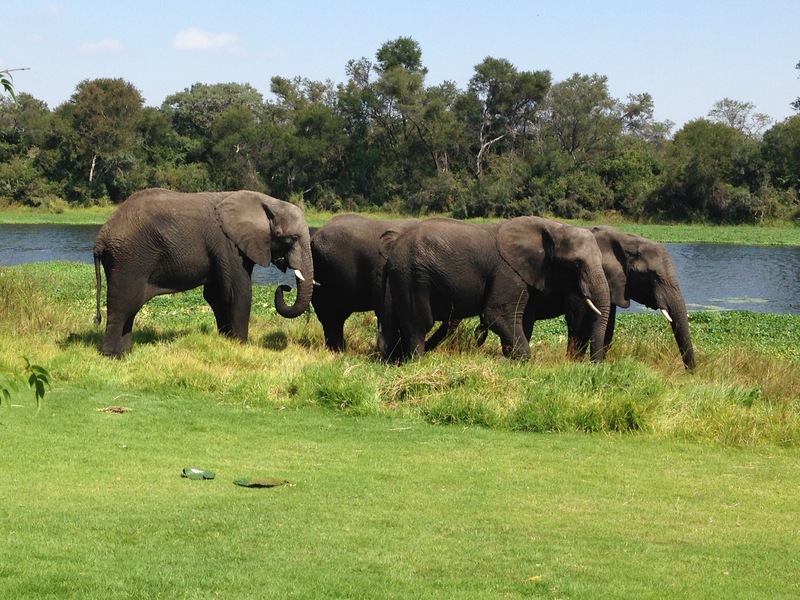 Elephants even paid a visit to camp, strolling among the tents, while the noise of the hippos throughout the night provided a soothing, if initially startling, soundtrack to the evenings. Wherever we went in Zimbabwe, we met people delighted to see us and proud to show off the considerable delights their country has to offer. But there is no ignoring the issues which face a country which has the ability to punch its weight as a real African powerhouse. 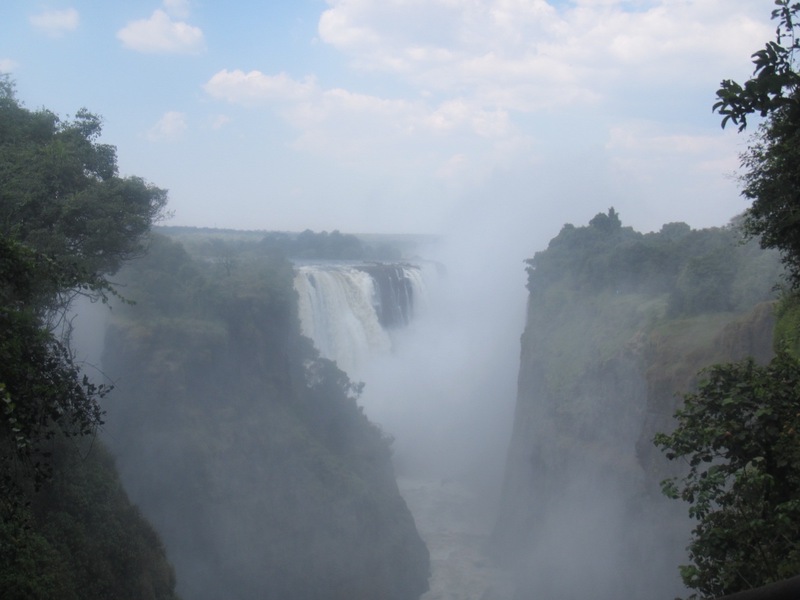 We began our journey across the country on the Victoria Falls to Bulawayo train, which a reader of a previous post thought was portrayed as a disappointing trip. Far from it, the night and following morning on the train providing a hugely enjoyable change of pace and chance to chat with the locals. But the train, in many ways, sums up the malaise which has beset the country. Far from the pristine carriages which Michael Palin recalled from his 1991 journey along the same route, the whole thing was falling apart. On the tour he provided for his privileged white passengers, the train manager mixed pride in his steed with frustration at the way things had been allowed to decay. From a train and railway system that worked, it has suffered years of neglect to the point where pretty much nothing works. Somehow, there are still enough people willing to keep things just about rolling forward, from the guy who helped us at the platform and said he had not been paid for 10 months but still turned up for work each day to the employee who chatted to me while at a station stop in the early hours. Whoever succeeds Mugabe should heed those words. Zimbabwe needs reforming from the ground up, not from the top down. And getting the railway back on the right tracks would be a pretty good start. THERE are more notable locations around Fife Avenue in Harare. The city’s Test cricket ground and Robert Mugabe’s presidential palace – complete with heavily-armed men in uniform patrolling the perimeter in case anybody takes an ill-thought out selfie – for starters. The reason for the visit was initially dismissed as merely a blister on the side of my foot, a side effect of my switch to flip-flops and my lifelong habit of walking on the side of my feet. Right up until a quick check after stepping out of the shower in the Zimbabwean capital discovered what had been a lump of hard skin was now a suspiciously squishy shade of yellow. Throw in a collection of bites which were just not healing and it was time to give in to the inevitable – and the urgings of a couple of people since a brief bout of sickness in Bulawayo, which was not followed by the normal swelling of one of my legs, well not much – and seek medical help. It has all added to a week of doing, largely, not a lot since leaving the big beasts of Antelope Park. It even, courtesy of a sore back and generally feeling rundown, had me retreating to my bed before it was even dark as most of the rest headed up to investigate the ruins of Great Zimbabwe, the former thriving civilisation which gave its name to the new country upon independence. 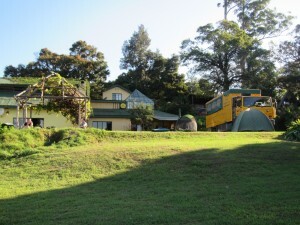 Which made a trip to Heaven, our home away from home overlooking the Chimanimani Mountains, a pretty ideal spot to kick back and relax (let’s be honest, the chances of me heading out on one of the long walks through the mountains or one of the adjoining hills were slim at best, even with non-aching feet). My foot, at this point, still enabled a walk down into the village and a trip to the local bar to celebrate Gareth’s birthday and add our names to the legions of former Oasis groups who have sought refuge in the same watering hole and left their mark on the walls. Not sure what was our main motivation to stay out late, more beer or avoiding going to bed as the altitude added to the falling temperatures, although an improvised nest involving my sleeping bag and Moroccan rug ensured it was all nice and toasty, as long as the heavy dew did not intrude too much. Still no sign of the rug’s supposed aphrodisiac qualities mind. 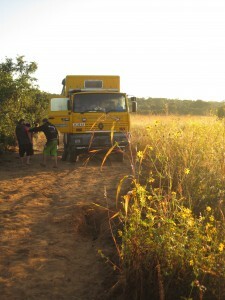 The pattern of hot days, cold nights continued as we rolled into Harare and set up home in the back garden of Oasis’ African base, complete with workshop containing four other trucks and the equipment Gareth needed to give Nala some much-needed TLC. But as others struck out to investigate the delights of the capital city (once they had managed to get further than the Black Banana bar down the road), the garden became my home for much of the next few days – bar that rather longer than intended trip to the doctors. Let’s get some things straight from the start. There was no crying out in pain. 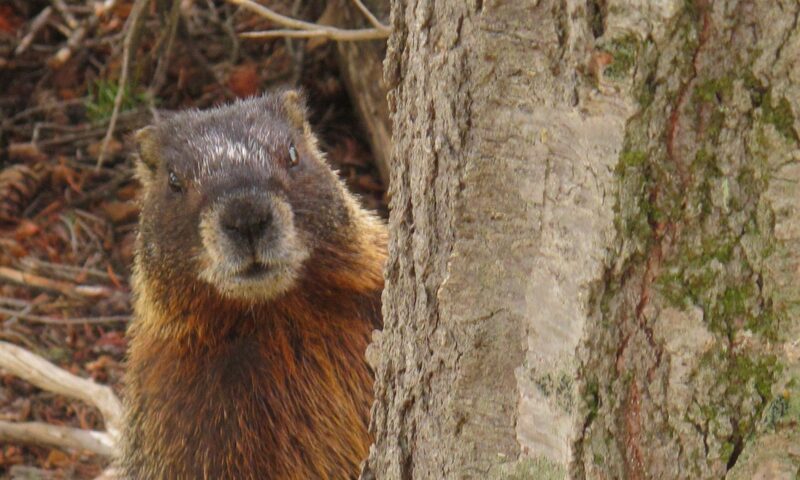 There was no squealing. There could easily have been (and nearly was), but there wasn’t. There was plenty of giggling, not all of which could be attributed to large quantities of painkillers injected in various parts of my body. Once, that is, the doctor had turned up half an hour after the start of surgery, which remained devoid of other patients until he arrived, followed by a crowd of people who wanted his attention and providing the signal for his receptionist (who had also taken my blood pressure, then disappeared) to start relieving me of some dollars. When he arrived, he conducted a thorough investigation which saw him fill first the rather large index card bearing my details and then the prescription form which was then handed to me with the instructions to go next door to the pharmacy, get everything on the lengthy list and head back so they could start administering them. Which is when it all went a bit weird. They were very polite and friendly in the pharmacy. But as quickly as the cashier got stuff off the shelves to fill the order, one of the pharmacists changed them for something else, only for the woman from the doctors – apparently not just a receptionist, but also the nurse (least hope so, given her later part in proceedings) – to repeatedly return, change the order and add things to the list. And then started the discussion of just how much was needed. Was 10 bottles of antiseptic necessary (having gone halfway down one bottle in three days, suggest not)? And did we really want a whole litre of something nobody was sure was actually needed? The doctor, it appeared, had decided we needed some extra to look after the rest of the group as the need arose. With me paying. Finally we had it all worked out and, armed with a cardboard box full of drugs, ointments and dressings, it was back to the doctors and a treatment table set up with some worryingly sharp-looking bits of equipment. Details of what happened next is all a bit hazy, mainly because of my desire to look anywhere but in the direction of what the doctor was doing with a long syringe and what appeared to be a razor blade. What is clear is that the two injections of local anaesthetic (think my first for anything not involving teeth as all my stitches, both rugby and beer related, have been done without) hurt. A lot. An awful lot. That’s where there was very nearly a fair amount of screaming, but instead just a badly-bitten lip. Thankfully, the injections worked and the actual cutting of the abscess was pretty straightforward, if rather disgusting, judging by the mess nobody appeared in a hurry to clear up. With the rest of my wounds treated, it was time for a couple more injections – not in the arm being proffered, but in my bum. Only having dropped my shorts did the nurse explain that rolling up my T-shirt would have been sufficient. And so, with my wallet lightened, foot bandaged, box full of drugs under my arm and under orders to stay off my foot, they ushered me out the door and told me to walk 10 minutes down the road to drop off a sample at a lab. Instead, it was a limp over the road to grab lunch, supplies for the next few days and a taxi down to the lab – the driver kindly waiting the half hour it took me to fill in a form, sit in a queue, be relieved of more money and have a previously unannounced blood test, before running me back to base and spending another 10 minutes running around everybody he could find in search of some change. All of which was highly amusing to somebody rammed full of antibiotics and painkillers. And that was pretty much my Harare experience, up until our final night trip to a barbecue and drinks at the home of fellow traveller Kris’ sister Sophie and her boyfriend Giles, who works for the EU. Not sure quite what was going through their minds when they kindly invited us lot back into polite society (with me struggling with my first experience of crutches dug out of the house by Mark, an Oasis tour leader recuperating from a joint bout of typhoid and malaria), but we were on our best behaviour as we did what comes naturally and huddled around the fire pit. And why not? 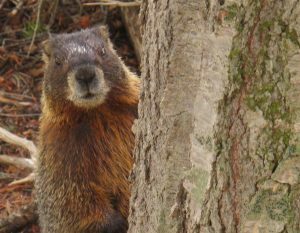 After all, he had posed for pictures alongside his sister, walked among us and generally played around like any youngster out for a walk. And, if all else fails, there was a stick in my hand to sort out any problems. But there was one over-riding fact which remained firmly at the front of my mind as they urged me to catch up with the trotting bundle of fluff and sharp, pointy bits. Cute he may be, but he was still a lion. Considering what its main attraction is, Antelope Park is poorly named. There are antelope, but make no mistake, lions are the main course at the private reserve that was our base for three nights after leaving Bulawayo. Antelope are more of a starter. 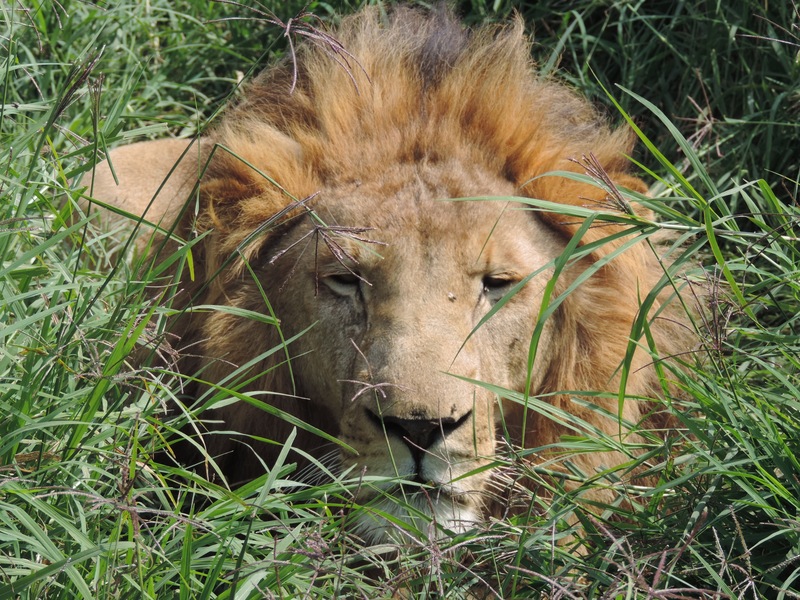 There are elephants to get up close to – closer even than Elephant Sands – and other wildlife (some managed to get excited about dangling a rod off a bridge among everything else on offer), but the lion’s share of the attention is reserved for the big cats. 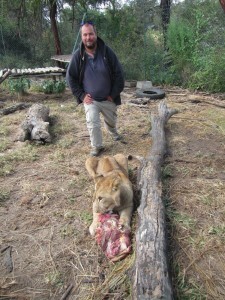 Walk with them, watch them eat, go out hunting with them and grab a string of photos with them, this is as close as we are likely to get (or want to get) to lions. Which poses one or two questions. Who is being exploited here? 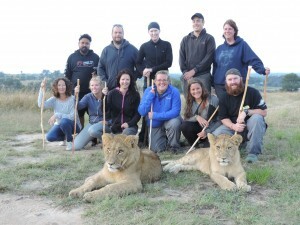 The tourists stumping up the cash or the lions (and elephants) who go through their paces for the cameras? And does that make this form of conservation with the animals kept in controlled environments (let’s be honest, enclosures), any better than other places which allow their lions to roam free, but with the risk of a hunter’s rifle cutting short their existence? Better to live a day free than a year in captivity? 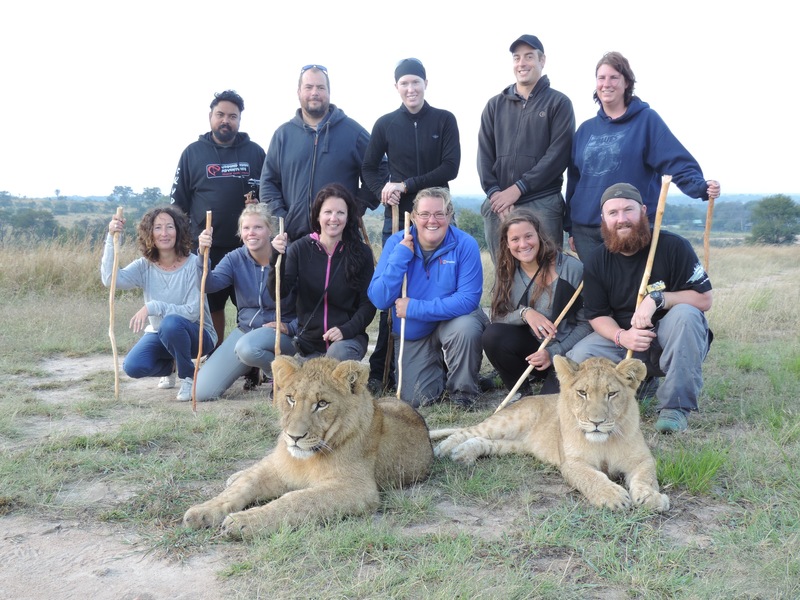 At times, particularly when the elephants were going through their routines for a handful of peanuts and the young lions were steered from one picturesque photo stop on our walk to another, there was a touch of unease. Right up until it was my turn to hand my camera over to someone else and step in for the killer snap with the big beasts. It is a long process as the lions, born in captivity, are gradually taught the skills they would learn naturally in the wild, are selected to form prides and then sent out to live as wild in protected reserves and, hopefully, provide future generations who will be no more subjected to human interaction than any other big cats. 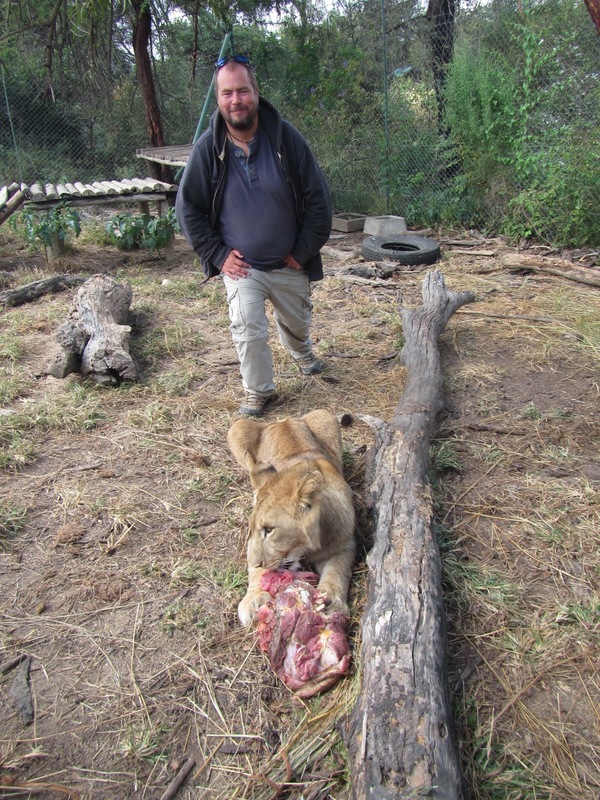 Alongside this, ALERT run programmes to educate us, lion’s biggest predator, on how we can co-exist – although still not entirely clear how any education is going to stop anybody reaching for his gun if a lion comes too close to his family or livestock. 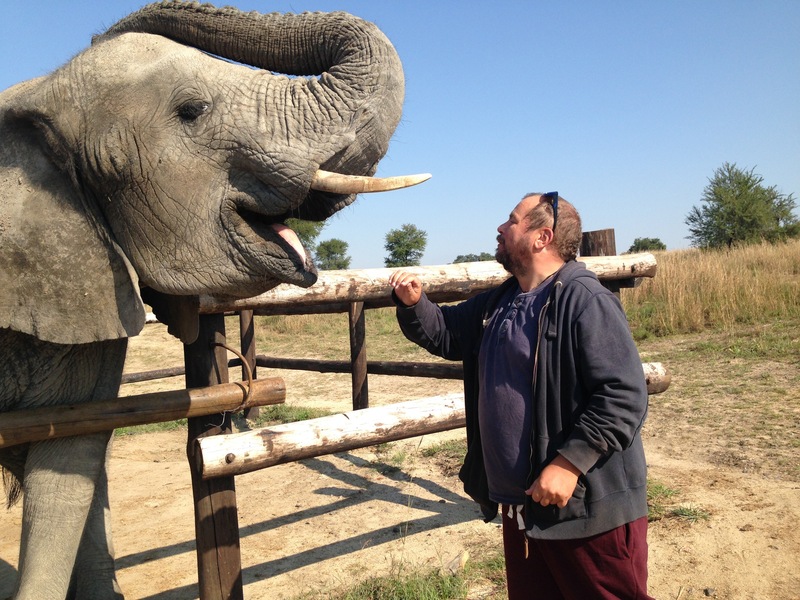 Our education began with a passionate presentation of the programme from Dan, who headed from the wilds of Somerset to Zimbabwe as a volunteer and has ended up as project manager, who also ran through the activities we could do with the animals over the next couple of days. With our individual timetables drawn up, we settled into life at Antelope Park with a few beers and steeled ourselves for a night huddled up for warmth as the southern hemisphere’s slide from autumn towards winter is really beginning to take hold as soon as the sun disappears. Before getting up close to the lions, first up on my schedule was a trip to interact with elephants. Early unease and a certain amount of cynicism at them going through their range of tricks with their handlers at “Elephant Stadium” was soon washed away as we were beckoned forward in twos or threes to our designated elephant and handed a fistful of food pellets to keep their attention. Drawing the line at going up on the back of our elephant (no animal should have to endure that), it remained a great thrill to be sat on the knee of one of these wonderful, dignified creatures – even if a quick flick of her trunk at one point made sure it was all on her terms. We had an unexpected second encounter with the four elephants as they were walked along (and in) the river which formed one side of our campsite, before a group of us were whisked off for our next activity, a tour of the lion enclosures. This is where the lions live 24 hours a day as they are assessed to see which would make the ideal pride or are studied by the programme staff and volunteers, particularly the lions who are suffering from feline HIV. 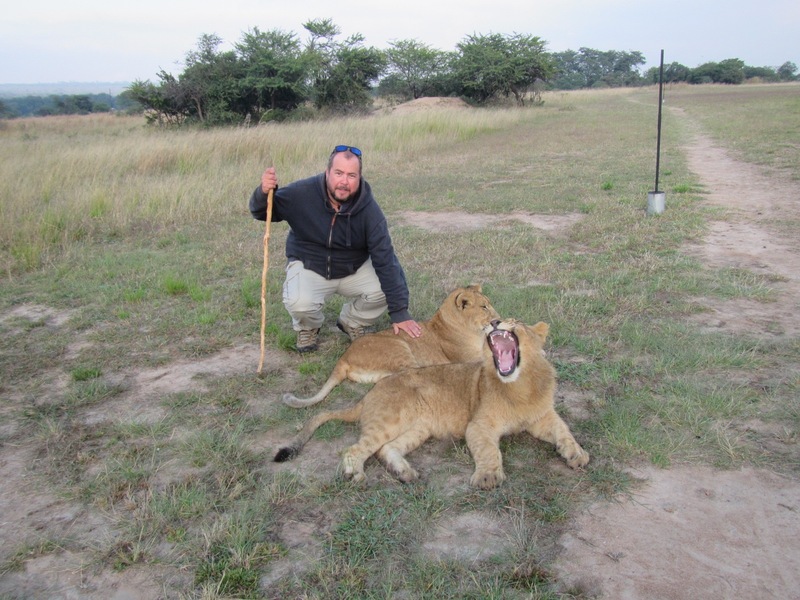 If that was our first encounter with the lions, the next day was dedicated to them, starting at the crack of dawn with an hour and a half strolling through the bush in the company of 10-month-old siblings Africa and Aleka. Playful, full of life and, to use Ale’s oft-used phrase, “so adorable” they thoroughly enchanted all of us for the duration of the walk. Yes, there were the staged moments as we stopped for them to be pictured on a branch, on top of a mound of earth or, one by one, with us crouching behind and stroking them or walking alongside them, but it was impossible not to fall a little bit in love with them. 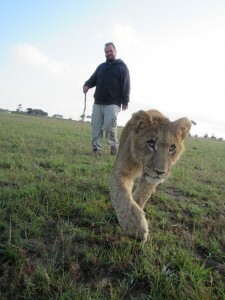 Even when the impossibly handsome Africa was getting a little bit bored with it all and really did not want to walk alongside me for my turn in front of the lens. He was far more interested in what his sister was doing. We were reunited with the pair, as well as another two youngsters, at feeding time, even getting inside their pens as they chewed away at great lumps of meat. There was certainly no getting in the pen, however, when the adults got fed. 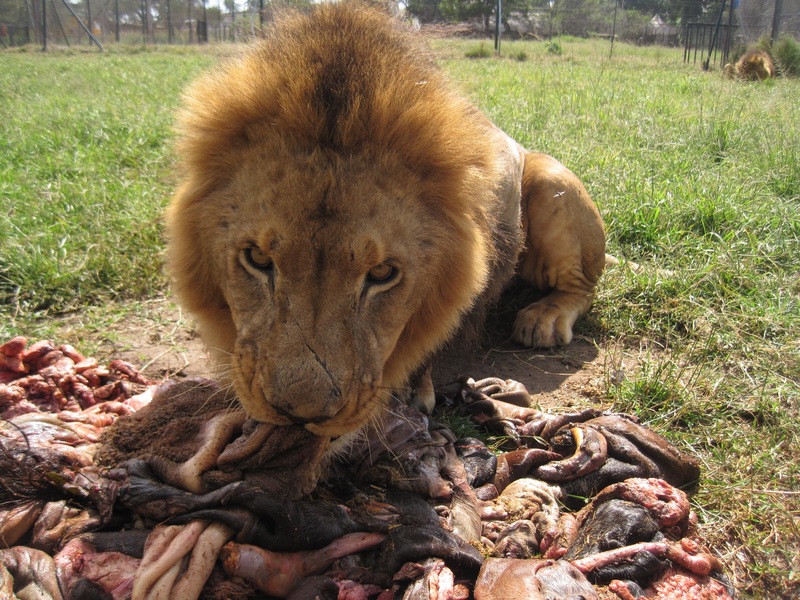 Instead, we were crouched up against the fence, inches away from a rather revolting pile of cow offal which saw the male lions chase down the hill to fight for the best bits. Yes it is totally choreographed and makes for the perfect video camera moment – the guttural noise is heart-stopping, as is the ferocity with which they contest the lion’s share, although no camera can capture the smell, especially when the contents of the offal sprays through the fence – but it is a moment to savour and, to be honest, there are times when things being that controlled are a bit of a relief. There was nothing too controlled about our final lion activity – three hours sat in the cold on the back of a jeep after dark as three adolescent lionesses (retired from the cub walk) were taken out to hunt whatever we came across. We spotted a fair few things in the gloom, mainly impala and wildebeest, but the lions (sisters known as the 3Ks, which was rather ironic to be out on a hunt with after dark) were more content to be out and about rather than worrying about their evening meal. They finally came to life in pursuit of a mongoose, a thrilling, all too brief chase through the scrub and trees which ended with the lions seemingly getting bored and letting their quarry go, just as it seemed they had it pinned down. So not the result most of us wanted to see, but perhaps a welcome reminder these are wild animals at heart and cannot be compelled to conform to any tourist’s must-see list. But over the course of three days, we had ticked off enough moments high up any list to keep even the most cynical of us grinning for days (or at least until the cold hit as we climbed into bed). Questions certainly remain as to whether this is the right way forward and is ethically any more about conservation than tourism, but two key facts sway my mind in its favour. Firstly, try looking into the eyes of a lion (or an elephant for that matter) and there is so much going on behind them. It is clear they will not do anything they really don’t want to. And, probably most importantly, better they are subjected to shots from endless cameras than one shot from a gun for the entertainment of anyone with enough money to pay for the dubious honour. IN the book Pole to Pole, describing his 1991 journey from the North to South Poles, Michael Palin described the train from Victoria Falls to Bulawayo as keeping the past “assiduously preserved”. Having made the same overnight journey across Zimbabwe, it appears the train has been “assiduously preserved” by doing absolutely nothing to it across the intervening 24 years. Not sure parts of it have been cleaned in that time. 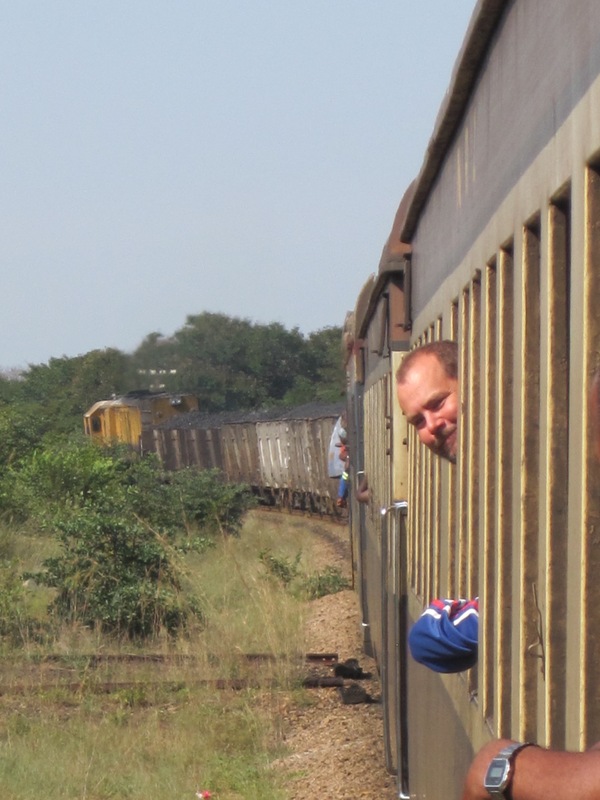 The National Railway of Zimbabwe – as with much in this fascinating, frustrating country with its somehow joyful, stoic population – has been through tough times since one of my travelling inspirations made the journey. 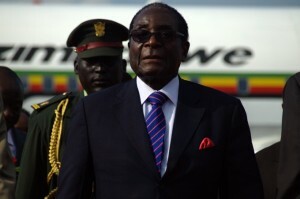 Plenty has changed since those relatively early days of independence (although the RR logo for Rhodesian Railways, picked out by Palin, still dots the carriages – along, seemingly, with the same paintwork and fittings, albeit in a less favourable state of repair) under the unbroken watch of Robert Mugabe. The fact our pockets are stuffed full of US dollars says much about what the country has been through. Hyperinflation, mass unemployment and a Government programme of land grabs all but turned the country into an international pariah. Yet people remain unmistakably proud of this beautiful country. Their first question is invariably “Are you enjoying Zimbabwe?” or “What do you think of Zimbabwe?” and on any journey you will get to chat to plenty of locals. They are friendly, eager to help, chat, hear about your trip and tell you about their country. And then you begin to hear tales of the troubles which have beset the country and how, even with things improving since the days of needing large bags of money just to pop down the shops (when there was nothing to buy anyway), many are still struggling to eke out a life in a land rich in natural resources. Just not, it would seem, too many that benefit the vast majority of its inhabitants. Immaculate is not the way to describe it now. Rather like the rest of the railway system, it has been allowed to decay. The pond has gone, some of the trees remain, but it needs some more fresh paint and the only visible addition since Palin’s arrival is a plaque commemorating a visit by Mugabe himself in 1998 for a visit of South Africa’s famed Blue Train. 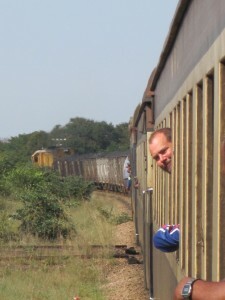 There is no faulting the helpfulness when we – Karla and myself, escaping from the confines of the group to Bulawayo a couple of days early – rock up to confirm our booking an hour before the train is due to leave at 7pm. The guy we have been told to ask for is the only person in the ticket booth, while an older gentleman does some running around on our behalf and the train manager appears to sort out our bookings by vacating in his carriage, allowing us to stay together. As we sit and wait with our bags and supplies for the night – on the floor, there are no seats and the chances of any food and drink on the train are slim – our helper comes over for a chat (and a tip). Having worked on the railways for 30 years, he has not been paid for 10 months. Yet he turns up everyday, “just in case” things change. He sends us off wishing us a good trip through Zimbabwe and ending a whistle-stop visit to Victoria Falls, which we rolled into after an early, relatively quick crossing from Botswana. 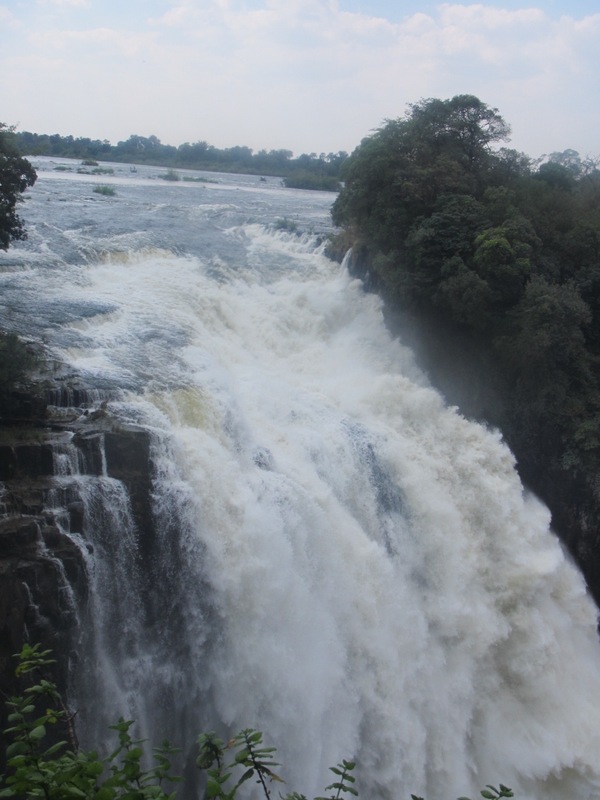 While many of the others raced to sign up to throw themselves off bridges and cliff edges on a variety of ropes and harnesses, my choice was a bit more sedate – a walk along the Zimbabwean section of the mighty falls (having confirmed the design for the trip T-shirts). Not that that was without peril, especially for the relative novice flip-flop wearer as the spray thrown up by what the locals call Mosi-oa-Tunya (The Smoke That Thunders) turns the path opposite into a shower, complete with slippery surface not that far from a huge drop over the edge and a whole host of rainbows. And that’s before you remember your passport is still in the pocket of your shorts and needs to be kept dry ahead of being despatched back to London in the quest for Ethiopian visas. But despite limited vision and the need to stay out of the worst of the spray to avoid a total drenching, the walk is a staggering experience as the water just over the gorge pounds over the drop at a remarkable rate, creating an amazing experience. And noise. Sorry Niagara, you are no longer my favourite waterfall. Dried out and stocked up for the train, that was pretty much that for Victoria Falls as we settled into our carriage and rolled away, pretty much on time, towards Bulawayo. It was a shame not to see more of the town, but for all that our group has meshed together remarkably well over the past six months (we hit that landmark when we were all reunited in Bulawayo), each of us needs some time away to clear our heads, get refreshed and prevent any minor irritations turning into anything more substantial. Karla still had to put up with the irritation of my snoring whenever the train stopped and retreated to the dining car – completely devoid of food – and bar (selling local brews in plastic bottles to local people) for much of the night. She could have slept undisturbed for one of our longer stops as a visit to the (limited) facilities ended with a lengthy chat with one of the staff who was clear who should take the blame for the decline of the railway and much of the country – the politicians. Businessmen are needed, he was clear, but politics keeps them away. Like several Zimbabweans we have met, he admitted it was not wise to criticise Mugabe (a subject we had been warned to avoid at all cost), but went ahead and did it anyway. Having, of course, asked how we were enjoying his country. We rolled into “Friendly Bulawayo” – as the welcome sign still declares, as it did on Michael Palin’s arrival – at noon, only three hours late, which is something of a success for this particular train line. With a Saturday afternoon to fill, a girl from New Zealand and a boy from Gloucester did what comes naturally and found (after much searching and debate among taxi drivers) a brand new bar showing rugby. Ensconced early (first ones in) on stools which needed a bungee rope to get off as the evening wore on, we settled into an afternoon of televised sport and chatting to the locals, one of whom remarkably used to live just a few hundred yards from my old school, while another finally drove us home as the last ones out the door. Sunday morning saw us checking out what Bulawayo has to offer, which seems to largely consist of pie shops. Along with fried chicken joints and pizza places. Very handy for late-night eats, not so good the following morning when everything else is shut. Actually that’s a bit cruel. It seems a pleasant enough place. A lick of paint here and there would do wonders and, like much of Zimbabwe, it leaves you wondering what it could be with the proper direction. 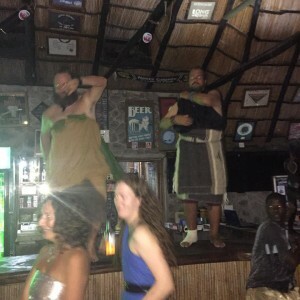 Refreshed and reinvigorated by a pie and a nap, we headed out again and found ourselves minor celebrities in a bar round the corner from our hotel, photographed by the management for their Facebook page and introduced to the director and several of the clientele. One was determined to have his picture taken with us, despite not having a camera on him, and equally keen to get hold of the ones we took for him, while another regaled me with his string of grievances at the government which, with a guy claiming to be an officer in the army at the adjacent table, was slightly unnerving and the onset of a, thankfully, brief bout of sickness was a good excuse to head back to bed. It has been a feature of this week, hearing about the problems of a country which people love but are very cagey about criticising in public, then reading about the British election online with people attacking all sides and the country as a whole. “Britain is broken” wrote Armando Iannucci in a very good article in the run-up to the vote (a phrase which then seemed to appear countless times in other items with no credit). Zimbabwe is broken and has been for some time, but nobody is writing that or saying it. Because they cannot. Perhaps those who will be moaning about another Conservative election win – confirmed by an alert on my phone a few minutes ago – might remember that whoever won, most people in Zimbabwe would love to live in a country as “broken” as the UK. And would love to be able to complain about it as openly. But let’s not, as we rejoined the rest of the group camping at a very pleasant site just outside town and playing with the owners’ young black Labrador, leave this on a negative. 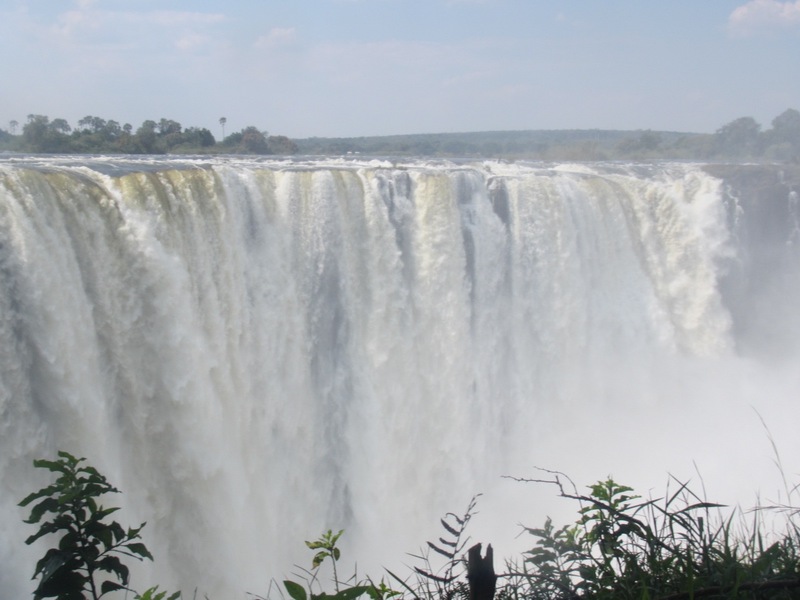 Zimbabwe, at least what we have seen of it so far, is a wonderful country filled with almost universally friendly people, eager to help and even more eager for you to enjoy your time here. And whatever problems they may still have, you’ll find no complaints from here on that ground.